Whether you like it or not, Transformers is expanding into a full-blown cinematic universe on the level of Marvel and DC, with upcoming fifth entry Transformers: The Last Knight serving to introduce some key players in the series’ extended mythology while planting seeds for potential spinoffs or even prequels. The Transformers have always looked particularly slick in car form, though this image doesn’t give us any indication of whether the transformed version of Bumblebee is going to look much different than he usually does. It does, however, indicate the fifth Transformers will be about as pleasing to gearheads as the previous four. Mark Wahlberg is reprising the role of Cade Yeager in this fifth film after originating it in Age of Extinction, and Josh Duhamel is also back reprising his role as Lieutenant Colonel William Lennox, who sat out the last entry but played a key role in the first three movies. Isabela Moner also stars as Izabella, described as “a street-smart tomboy who grew up an orphan and was raised in foster care.” Jerrod Carmichael and, curiously, Sir Anthony Hopkins (??) are also in the cast. 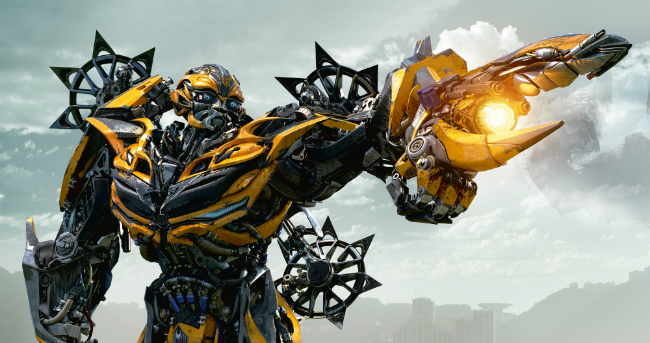 This will be the first Transformers movie to arrive in the wake of a writer’s room forming at Paramount to hash out ideas and scripts for the series’ future entries. Art Marcum and Matt Holloway, who delivered the Iron Man 3 script, collaborated with Ken Nolan (Black Hawk Down) on this entry, so it should be intriguing at least to see what gravitas they could bring to the franchise.